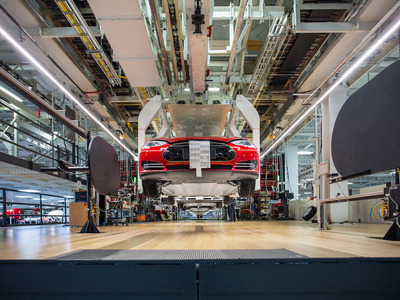 TeslaMost of Tesla’s vehicle assembly occurs in a factory building in Fremont, California. Tesla‘s new Model 3 assembly line is in a tent, CEO Elon Musk said on Monday. Musk later said the tent was better than the factory in Fremont, California, where most of Tesla’s general vehicle assembly occurs. On Monday, the journalist Edward Niedermeyer posted photos of what appeared to be permits giving Tesla “temporary approval” for the tent and the equipment inside it for up to six months. According to Ars Technica, Tesla has plans to build another building, presumably to handle the increased capacity required by the Model 3 sedan, Tesla’s first mass-market car. Tesla has struggled to ramp up production for the Model 3 since its launch in July. The company has repeatedly missed production goals for the vehicle, but during Tesla’s annual shareholder meeting on June 5, Musk said it was on track to hit its goal of making 5,000 Model 3s a week by the end of the month. On Friday, Musk said in an email to employees that the factory was capable of making 500 Model 3s a day and that some parts of the production line could make about 700 a day, though he said that “radical improvements” were needed in parts of the production line.